In 2015, I made three-month old E a lion costume. In 2016, I bought a Carter’s panda hoodie and made a science/medical officer long-sleeve top that matched my science/medical officer sheath. It felt redundant and infantile to get another Carter’s hoodie costume. 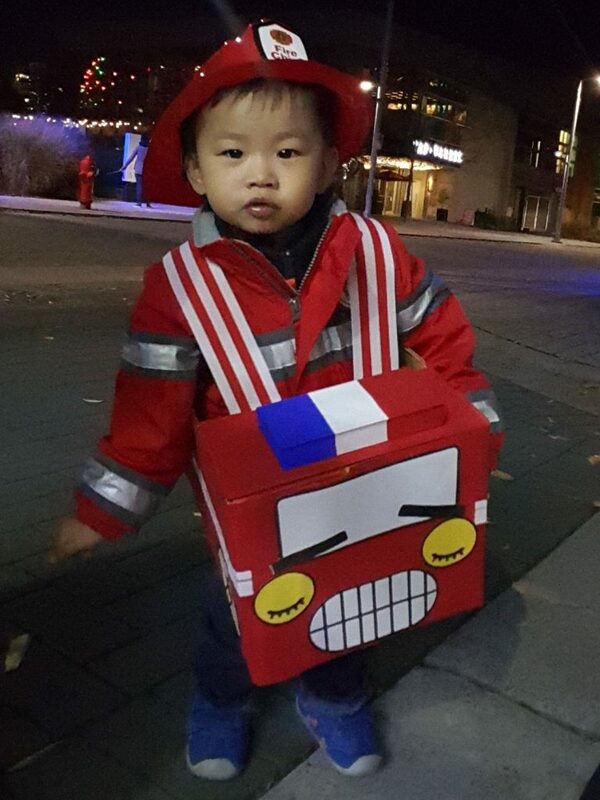 E could fit into a 24-month size but when inspiration for a costume hit, I couldn’t deny it. The other costumes sold at Costco were these licensed characters like Spiderman and some Justice League characters. The police officer looked intriguing but came with some props I disapprove of like a baton and handcuffs. The smallest size, XS, was for three- to four-year olds and I didn’t have to pull it off the rack to know E would be swimming it at just over two years old. 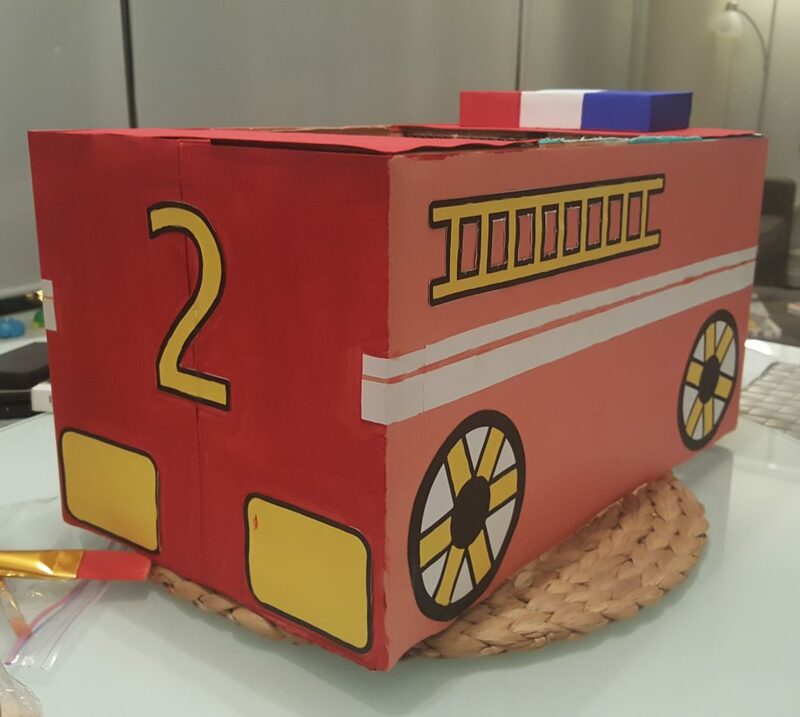 At a sale a while back, I bought the Carter’s fireman jacket and from a firefighter-themed birthday, E got a plastic hat so I was halfway there! Is this my life now? LOL. I was so eager, I started and finished two months in advance of October 31. 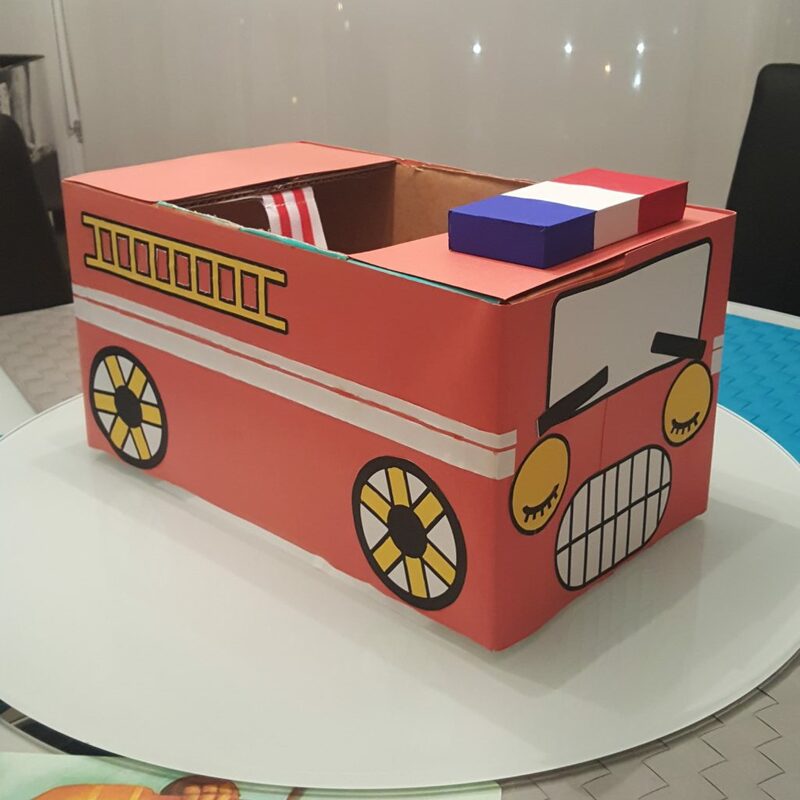 Googling “fire truck DIY” or some such, I came across this cute version of the fire truck box. I could see how I could create the features in Powerpoint and glue them on with minimal painting: all over red and then some yellow accents. I found I didn’t even need to paint the diaper box all red – and how horrible it would look if I had. I taped down red Bristol board and was quite proud of myself how professional it looked, how smooth the surface. NPY said the blue-white-red lights were actually for police cars but I don’t care. I thought it was a really nice 3D addition to the original inspiration. I wondered how I was going to secure the straps as the diaper box was too thick to punch holes to loop it through. This is where duct tape saves the day and the straps were secured with several layers. As I said, I finished the costume two months early and then left it in the living room. Although the shades are down all day, it faded and I found myself having to paint the red to make it sharp again. And here you have the whole costume in action! The kid was really happy and NPY impressed. We took him out for just an hour and went up and down two blocks and it was plenty fun.